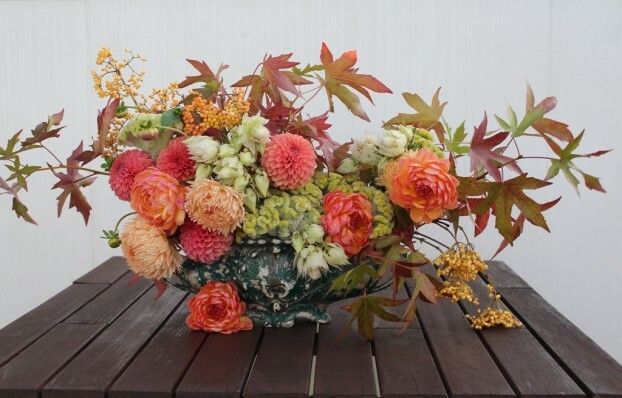 Lush, early autumn colors of corals, peaches, ivories and celadon green. Dahlia season continues here in the Pacific Northwest, where local flower farms in Washington and Oregon have produced bumper crops for 2015. I’ve been traveling so much this summer in order to co-host and promote the Field to Vase Dinner Tour, that the last four weeks have been a blur. I haven’t posted a Slow Flowers Challenge bouquet since August 27th when I shared Week 34. Yikes! Please forgive me! As if that wasn’t enough, we moved in July. Moving into an apartment after selling our home (and its beautiful garden) has been an exhausting transition. We’re getting settled in a place located quite close to downtown (I can see the Space Needle from our apartment! ), but I now realize what an effort it takes to procure flowers when one doesn’t grow them oneself. This move has provided me with a valuable lesson and an important insight about how hard it is to enjoy seasonal flowers in one’s home. It’s so much easier when you can just step outside and clip to your heart’s content. Thankfully, where I live, I’m able to enjoy outdoor space and fresh air. We have a small balcony attached to our unit and upstairs, there is a massive rooftop deck. These are daily luxuries. Access to flowers is a little more challenging. Have you ever seen a celosia this gigantic? Yesterday, I attended a board meeting at the Seattle Wholesale Growers Market. In exchange for several hours sitting around the table with my fellow board members, I was rewarded with a chance to shop the Market floor afterwards. 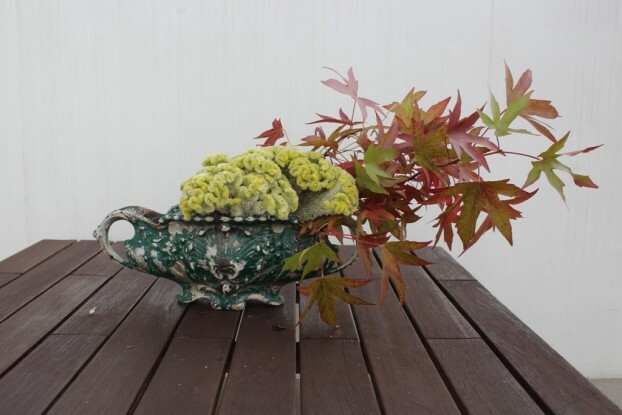 Step One: Start with a few branches of Liquidambar – a sure sign of fall! 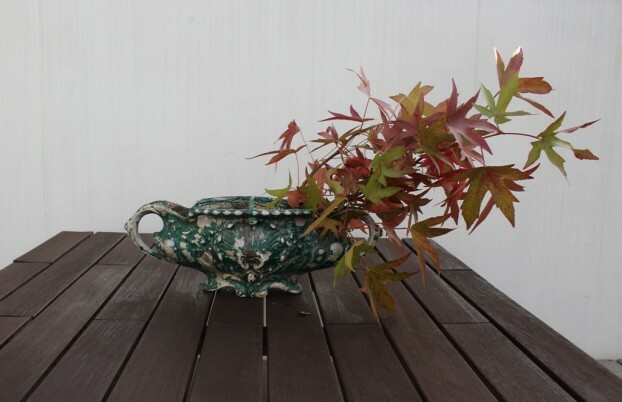 Place them off-centered to exaggerate the width of the urn. You will LOVE the goodies I came home with! 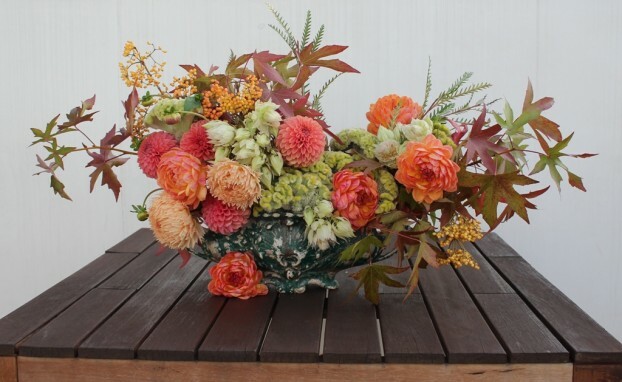 This arrangement is constructed using chicken wire inserted into the vintage cast-iron planter. 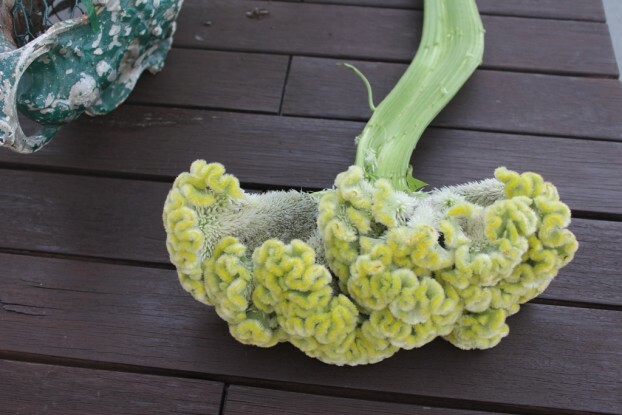 Step Two: Insert one enormous pale-green celosia to give weight to the arrangement. 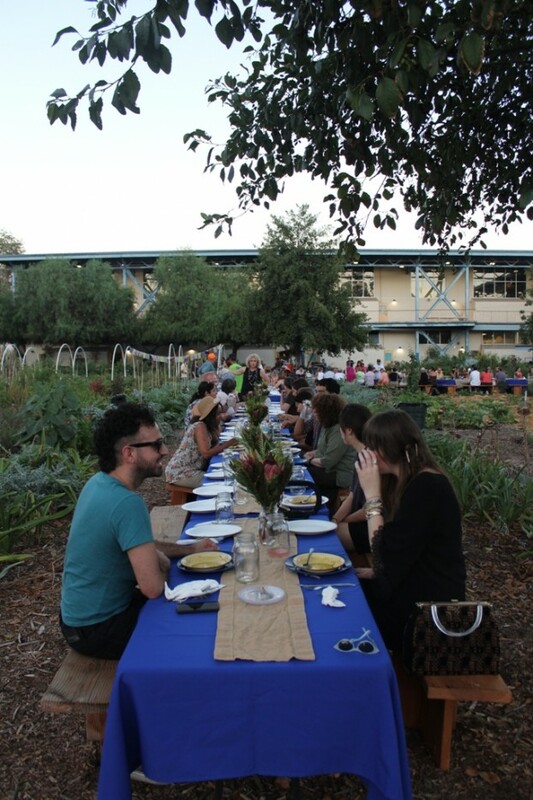 Dining al fresco at Muir Ranch, an urban school’s food and flower farm in Pasadena. 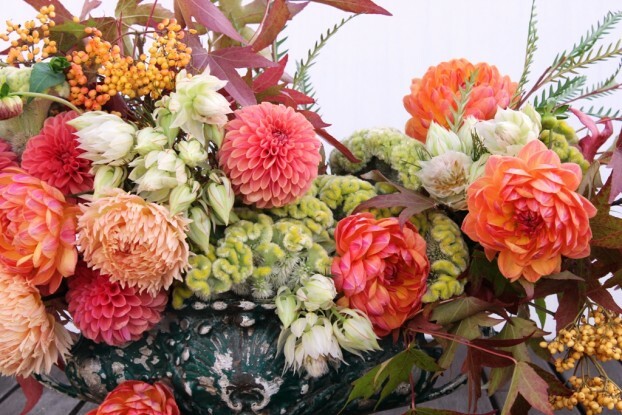 There are also two wonderful “bonus” elements in this bouquet, both California-grown. On Sunday morning, I flew back to Seattle from Burbank with generous bunches of grevillea foliage and Serruria florida ‘Blushing Bride’ in my carry-on bag (of course). 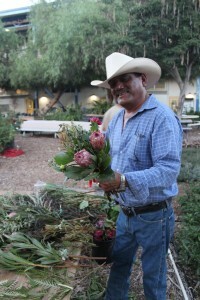 They were gifts from Resendiz Brothers Protea Growers and flower farmer Mel Resendiz. We met up last Saturday night at a special farm dinner held at Muir Ranch in Pasadena, which hosted more than 100 guests who learned all about urban agriculture (see above). Many of the guests were fellow members of the Garden Writers Association, who were in Pasadena for an annual symposium. They came for dinner and met some very talented high school students who are producing food and flowers for the CSA at John Muir H.S. Our host Mud Baron, urban-ag activist and creator of “Flowers on Your Head,” invited Mel Resendiz and Diana and Bob Roy of Resendiz Brothers Protea Growers to join the fun. Mel cranked out some beautiful bouquets for the tables and somehow I ended up with the very special ‘Blushing Bride’ to bring home. It is in the proteaceae family and Diana tells me the flowers dry beautifully. 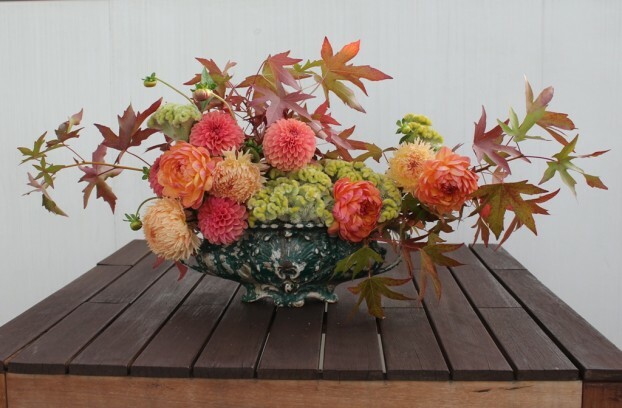 Step Three: Add three types of dahlias, blending colors for depth and interest. 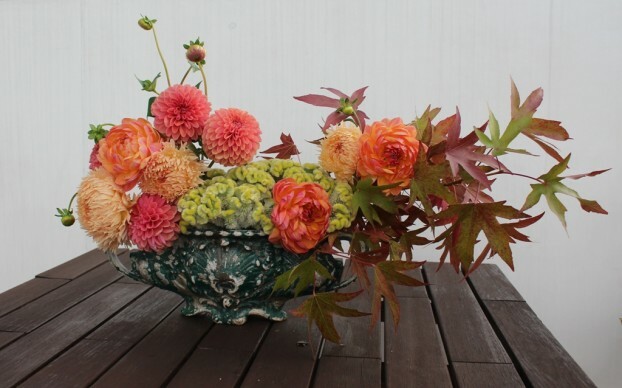 Step Five: Tuck in clusters of ‘Blushing Bride’ and notice how much the ivory-cream petals echo the celadon green celosia. Step Six: Incorporate ‘Michael Dodge’ viburnum berries to add sparkle and texture. I *think* I can get back on schedule for the Slow Flowers Challenge. It has been rewarding to see what everyone else has produced while I’ve been away from my clippers and vases. 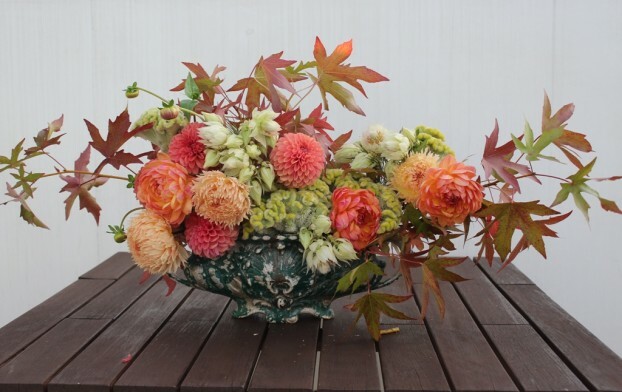 This entry was posted on Thursday, September 24th, 2015 at 4:11 pm	and is filed under American Grown, Blog Posts, Creativity, floral design, Flower Farming, General, Slow Flowers Challenge. You can follow any responses to this entry through the RSS 2.0 feed. You can leave a response, or trackback from your own site. Those glorious colors … reminds me of a bowl of Sorbet! Such a pretty palate.